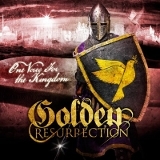 I picked up Golden Resurrection's latest, One Voice For the Kingdom, somewhat at random after reading a forum thread on a metal site. For once people were apparently being open-minded, because instead of the usual flamewars, all I saw was that this was a good neoclassical album. In fact, this is yet another project of the unstoppable power metallist Christian Liljegren, the guy behind Narnia and Divinefire, with the inevitable guitar shredding courtesy of Tommy ReinXeed. Like their past projects, this is power metal, but with a major neoclassical influence. As one might expect from Liljegren's past projects, the lyrics are unabashed promoters of Christianity -- one isn't a few words into the first track before noticing that this isn't the sort of Christian metal albums where the references are oblique and carefully planted. This might turn off some pickier listeners, but I rather liked the pure corniness of it all. ReinXeed's guitar work is straight out of a Malmsteen album, the first track reminding me very much of Magnum Opus, and like Malmsteen's work, some will love it and some will hate the breakneck guitar picking, driving melodies, and intricate solos. Liljegren's vocals manage a decent amount of grittiness despite the smooth, slick nature of Golden Resurrection's neoclassical sound. While the title track is disappointingly weak (it's heavily dependent on keyboard and sounds a heck of a lot like a certain Journey hit), the first two tracks are much better, and Night Light, the fourth track, is excellent, with a plodding beat, a fine melody, and a hard determined bent to Liljegren's voice. Most of the middle of the album is quite good as well. Golden Resurrection and its followup, Can't Slow Down have a nice guitar-bass combo when running at high speed, which is often, and on Can't Slow Down Liljegren manages to make his voice a but more of a growl -- as much as he can do, anyway -- which goes well with the driving bass. One does get a bit tired of all the guitar/keyboard duels (and did they really have to put two tracks worth of instrumental guitar shredding in? ), but they are beautifully done, and the melodies, though occasionally getting transitions that are a bit rough, still usually contribute greatly to the overall technical excellence of the album. All in all, One Voice for the Kingdom is quite well-made, and even some of the typical drawbacks of both neoclassical metal and Christian metal don't really hamper it much, as long as one takes it for what it is. This probably won't become a classic anytime soon, but it is certainly worth listening to.